Last updated by Mark Jala at December 10 . Anolon Ultra Clad cookware is healthy, dishwasher safe, induction ready, stylish and being fully clad with aluminum, a fantastic performer. Cooks will love Anolon Ultra Clad. I’m a big fan of stainless steel cookware and it’s great to see Anolon with more entries of stainless steel to their product line-up. Unlike other stainless steel cookware that is clad only on the bottom, Anolon Ultra Clad is clad with aluminum all the way up the side walls. This is a great benefit for cooks because it distributes heat not just on the bottom but all around the food. A cook will use a lower heat setting when making rice, oatmeal or other thick sauces or foods. 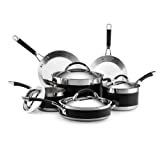 Anolon Ultra Clad cookware is fully clad stainless steel cookware with a heat distributing aluminum layer not just on the bottom but also up the side walls. This gives a cook the maximum control of heat and it uses less power also. 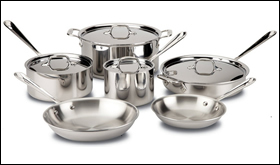 Anolon Ultra Clad cookware is stylish and it has great performance.